The view off my deck is very decidedly moving in an autumnal direction. 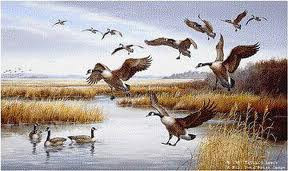 I am awakened every morning by a cacophony of goose honking. (I considered using "Honk!" as today's "good word" but rejected it quickly. There's not much good to say about Honk! in my humble opinion at this moment. I am reminded, however, of another autumn week once when I was taking a writing class. Our teacher challenged us to write a Haiku Poem each day for the next week. My reaction, as usual--rebel that I am--was to think "No, I don't do haiku." Haiku had never typically been my genre. But then neither had any other type of poetry. And my commitment to the class was to at least give it a try. Now, a few years later, as the leaves change colour, the geese begin to assemble for migration, the squirrels get crazy active, my thoughts turn to Haiku. There you go. Five of my haiku a day for an autumn week. What about you? Any budding haiku poets out there? By all means share.